Amritsar: To step-up its campaign for the Right to self-determination for the people of Punjab, the Dal Khalsa will organize‘Right to Self-determination March’ at Hoshiarpur, Ludhiana and Zira on 26 January as India will celebrate its seventieth Republic Day. The ‘March’ will prepare the Sikhs and other people of Punjab to the nuances of this peaceful method to get the right of self determination under the UN treaties and conventions and to reiterate how since Nehru’s speech of 3 June 1947, India has sustained its negative posture to this. Notwithstanding India’s political stand, India is duty bound to honour its international commitment on this under UN conventions and covenants. 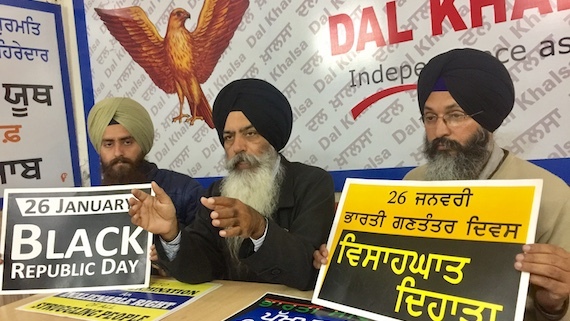 As the Punjab government will hold state-level Republic Day functions in Hoshiapur and other cities and towns of Punjab, the Dal Khalsa will hold three meets in three different cities to build a crescendo in favour of the right to self-determination. Terming January 26 as a black day for the Sikh nation, they said “Sikhs of Punjab are peacefully and democratically struggling to get this right but it’s ironic that they are facing hawkish Indian state, which has not only denied them this right but portrayed their demand as separatist and classified it as illegal and parochial. “We believe the only way forward to resolve the Indo-Sikh social, religious, cultural and political disputes is to set in motion the process for the right to self-determination with the UN standing as guarantor,” said Kanwarpal Singh.